Aussie demand dented by falling equities and poor Q3 GDP figures. AUD/USD holding above 0.7250, bearish below it, bullish if it quickly regains 0.7300. 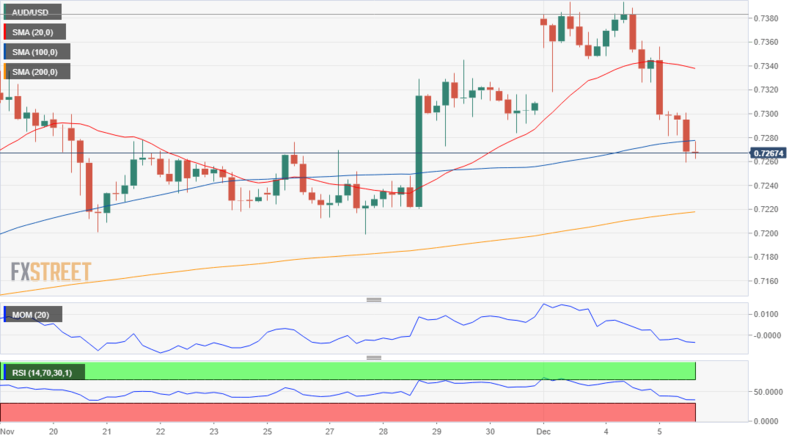 The pair heads into the Asian opening barely trading above the mentioned low, and short-term bearish according to the 4 hours chart, although holding above the critical 0.7250 level, perceived as a line in the sand. In the mentioned time-frame technical indicators remain at their daily lows near oversold readings, while the pair is ending the day below the 100 SMA and further below a mild-bearish 20 SMA. A quick recovery above the 0.7300 level once the market resumes normal activity, will indicate bulls are still dominating the pair.